At home or on the go, a tablet that’s portable and bag-friendly is a better option than a cumbersome laptop to take to the library, to bang out the latest assignment or to download a movie for some downtime at the weekend. An iPad is top of most wish-lists – for spec and performance – but it’s not always within everyone’s budget. Today, there are ever greater numbers of cheaper makes flooding the market. Which tablet to buy then? Let’s take a look at the best cheap tablets of 2015. What to Look for in a Tablet? What should you be looking out for when choosing your tablet? Keep in mind a few guidelines, in addition to the cost to help choose the best model for you. With a screen size of 8.3″ and 8 colours to choose from the new Hudl 2 certainly looks good. It’s far from a case of style over content, though: it runs Google’s Android KitKat system and comes with built-in WiFi and 8 hours of battery life. All of which makes the Hudl 2 a pretty smart choice for just £129. It’s bigger, better and faster than its predecessor, and is really great value. For more information, go to: Tesco.com. The LG G-Pad V 500 features a high resolution display and a stylish narrow bezel, crystal clear images and fine picture quality. And the features? It’s got an impressive 5 MP AF BSI camera, two gig of internal memory, 16GB of eMMC Memory. All for a shade under £200. Which, for our money, is pretty impressive. For more information, go to: Lg.com. A tablet for under £100? Really? What’s the catch? Well, on the surface of it there isn’t really one. 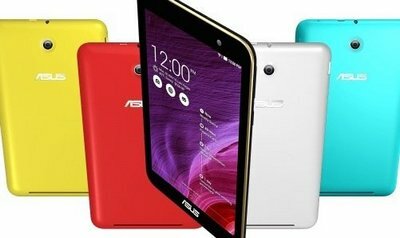 The Asus MeMO Pad 7 is pretty impressive for the price, and low cost is what Asus do well (they’re also the people behind the popular Nexus). It’s got a 7-inch screen and comes with a host of features and specifications that you might only expect to see on higher end makes. For more information, go to: Asus.com. Less than £160 will pick up the Linx 10, a 10″ screen tablet with 32 GB internal storage that’s available in black or white. Ideal for students, it’s about more than email – you get a 12-month subscription to Microsoft Office, while it’s also really well suited to video, photos and games. For more information, go to: Linx-tablets.com. The it 10 is a new (and UK-manufactured) 10″ Tablet PC. What are the vital statistics? It comes with Android KITKAT 4.4, Google App store preloaded and supports all 3D games, music and applications. The it 10″ also boasts an HD display, Bluetooth, WiFi, USB, HDMI, 3G, 2MP dual camera, 16GB Internal Storage. 32GB SD card slot and 1GB RAM. Phew. Currently on Amazon for just £79 with free UK delivery, it’s got to be worth a look at that price. For more information, go to: Amazon.co.uk. All of the above examples show that the price of Android tablets has really come down in the last year or so. It’s worth remembering, though, that you do generally get what you pay for, with very few exceptions – so think before you part with your hard-earned cash or dip deeper into your student finances. Like our pick of best cheap tablets? Take the organisation of your studies to the next level with a few of our favourite task management tools and software.